This recipe was too good not to share right away, plus it’s perfect for Cinco de Mayo! I used half of the beef for the taco bites (I only bought one can of crescent rolls) and the other half I set aside to take to lunch tomorrow along with this cilantro-lime rice I whipped up quickly. Check out my vine to see the process in action! * I divided the Homemade Taco Seasoning recipe in thirds to get just enough seasoning for this recipe. ** I used cocktail tomatoes because I couldn’t find plum tomatoes at my local grocery store. Preheat oven to 350 degrees F and prepare two baking sheets by lining them with parchment paper. In a skillet over medium-high heat, cook ground beef until no longer pink, crumbling while cooking. Drain the fat and return the beef to the skillet. Add onion to the skillet and cook until soft. Add taco seasoning and water and stir until thoroughly to combine. Reduce heat to low. Cover and simmer while preparing crescents. On a piece of parchment paper, unroll one package of crescents. Cut each triangle in half, so that you have two smaller ones. Don’t worry, they won’t be exactly symmetrical. Gently separate them and arrange on parchment so that they are easy to access. 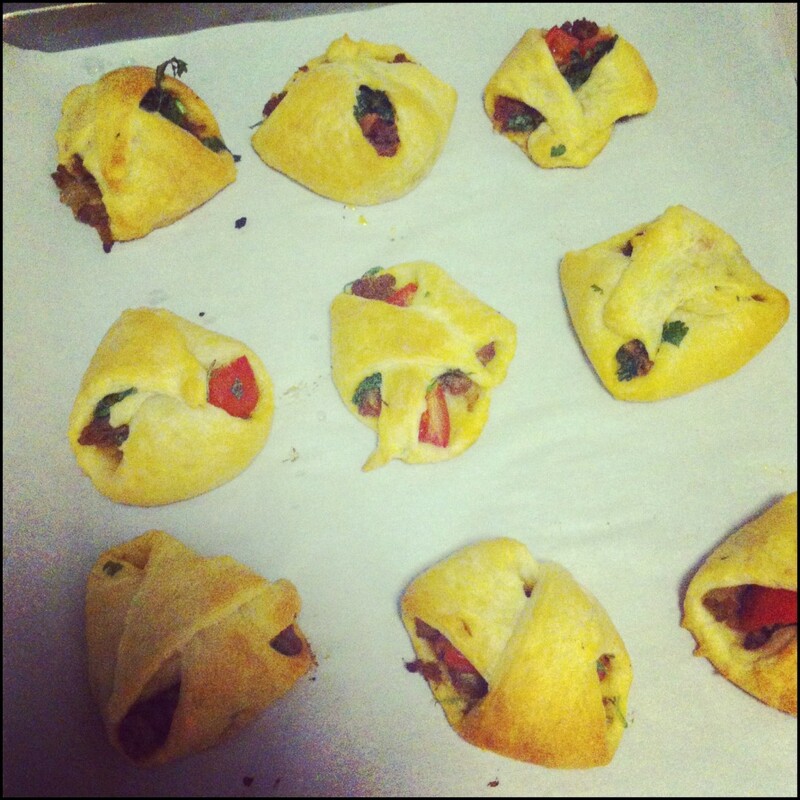 Place 1 1/2 – 2 teaspoons of ground beef mixture onto each crescent triangle. Top each triangle with a few pieces of chopped tomato and sprinkle with some cilantro. Fold the points of the dough over, so that it comes together like a diaper, pinching the dough as the pieces come together to secure. Some stuffing may fall out- just stick it back in. Place onto prepared baking sheet and bake for 10-13 minutes until golden brown. Repeat with remaining ingredients and second package of crescents. One more note: This recipe calls for cheese, but since I don’t eat cheese I left that part out. Cheese lovers- check out the original recipe! On Superbowl Sunday we went over to a friend’s house to watch the game and we were served this delicious stew. 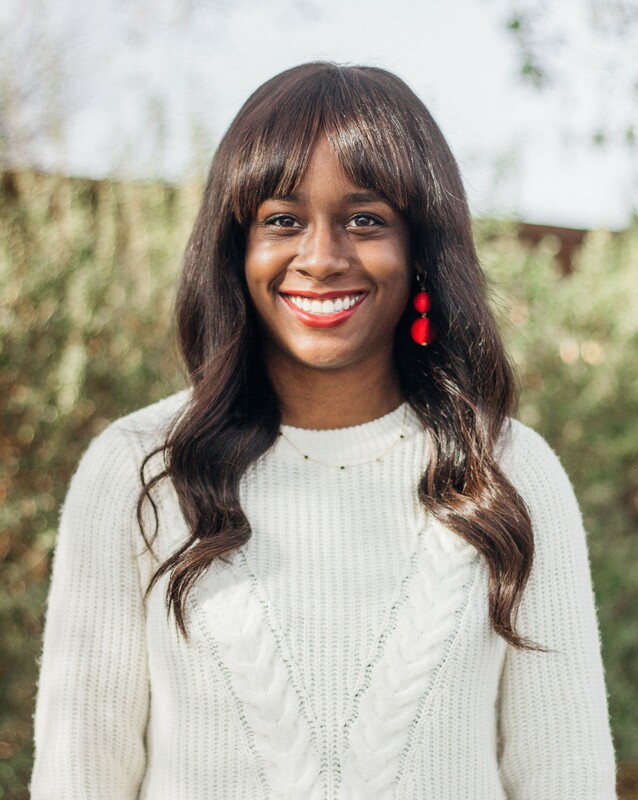 The next day I texted our hostess to ask about the recipe and when I saw how easy it was, I knew exactly what I was making for dinner that night. 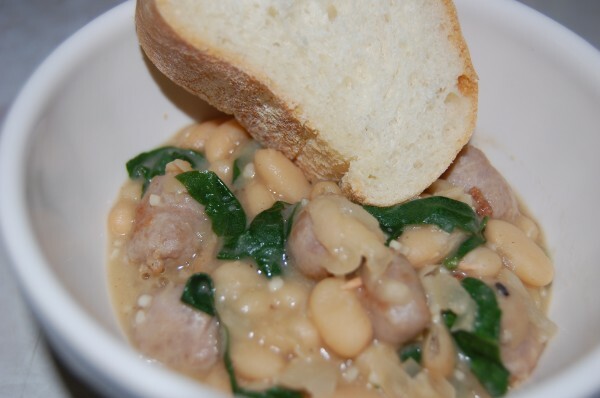 This stew can be served with many different things (I ate it with bread, rice, and pasta) and any way you eat it it’s muy delicioso! 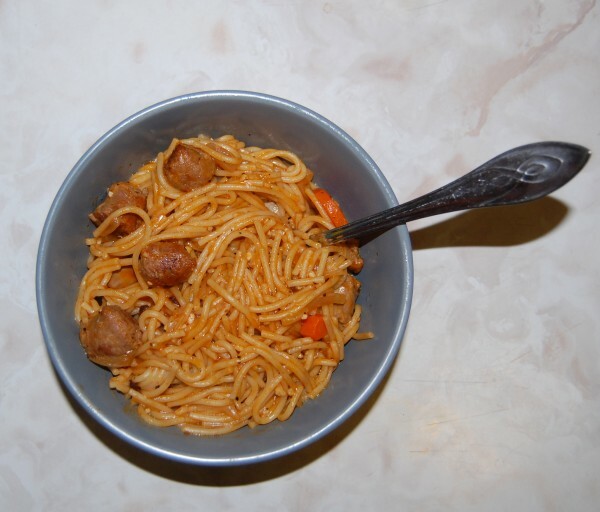 * I used sweet sausage, but I did add a dash of red pepper flakes for a tiny bit of kick. ** I used regular spinach, chopped (only because my local grocery store was out of baby spinach). Heat 1 tablespoon oil in a large skillet or pot over medium heat. Chop sausage into bite-size pieces, then add to skillet and cook, turning occasionally, until browned and cooked through, approximately 5-10 minutes. Transfer sausage to a plate. Reduce heat to medium. Heat remaining 1 tablespoon oil in same skillet. Add onion, garlic, and thyme sprig. Cook, stirring occasionally, until onion is softened, 5-8 minutes. 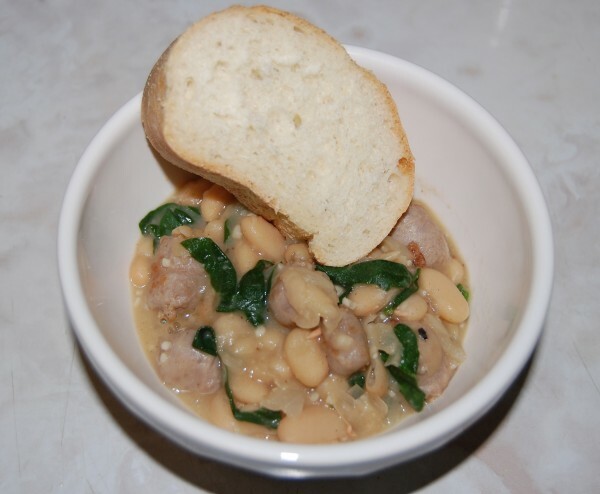 Add beans and broth and cook, crushing a few beans with the back of a spoon to thicken sauce, until slightly thickened, 8-10 minutes (if it’s not as thick as you want, cook it a little longer). Season with salt and pepper. 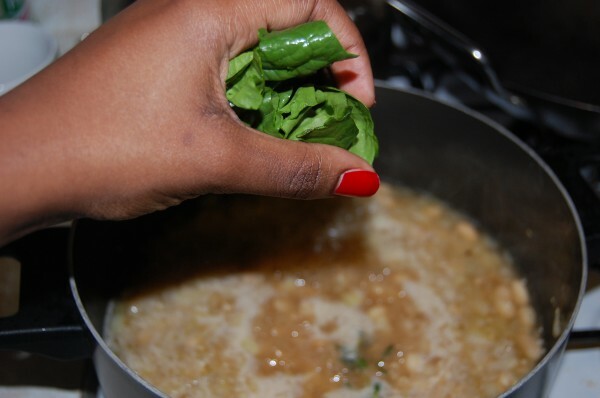 Add spinach by handfuls and cook just until wilted, about 2 minutes. Fold the sausage into the stew; add water to thin, if desired. Divide stew among bowls; drizzle with oil and sprinkle with paprika, if desired. One more note: I made this recipe again this week and this time I used bacon instead of sausage because my local grocery store was out of sausage. I have to say, it’s also really tasty with bacon! So far I’m doing pretty well with my goal of trying at least one new recipe a week. In case you haven’t noticed, I’m a fan of simple and delicious recipes. I don’t have a ton of money to spend on fancy rare ingredients or lots of space in my kitchen, so when a recipe can be made all in one pot like this one, I’m all over it! Bring a large kettle or pot of water to a boil. Season the sausage with 2 teaspoons salt, 1 teaspoon pepper and the marjoram. Heat the olive oil in a heavy-bottomed pot over high heat. Add the sausage and brown on all sides, about 5 minutes. Transfer to a plate with a slotted spoon. Add the onions, garlic, bay leaves and tomato puree to the pot. Reduce the heat and cook, stirring, until the oil turns deep red and the onions are tender, 6 to 8 minutes (If you like crispier carrots like I do, add them after the onions are tender and cook for another 2 minutes. If you prefer softer carrots, add them at the same time as the onions). If the onions are sticking, add a splash of water and scrape the bottom of the pan with a wooden spoon. Add the spaghetti to the onion/carrot mixture and stir-fry until golden, about 6 minutes. Add the sausage and enough boiling water to cover the pasta by 1/2 inch (this is important- don’t add too much water or your sauce will be too thin). Simmer, stirring once or twice, until the pasta is al dente and the sauce thickens, about 10 minutes. Season with salt and pepper and garnish with cheese, if desired. You guys seemed to enjoy the recipe I posted a couple weeks ago, so I’m back today with another one! Asian food might just be my favorite type of cuisine, so I really wanted to give this recipe a try. It’s not too complicated and doesn’t take a whole lot of time to prepare either. 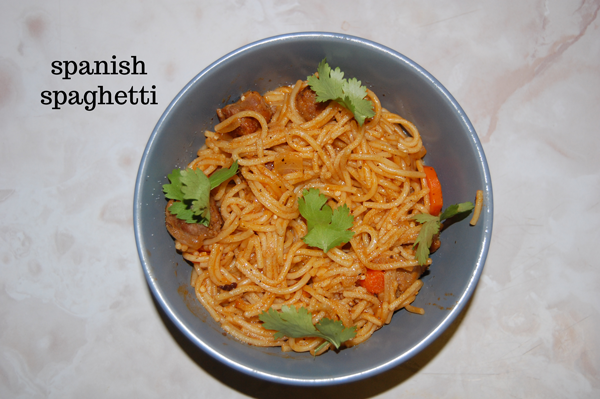 Read on to find out how I made this tasty dish! * The original recipe calls for fresh ginger, but I didn’t have any, so I used ground ginger. ** The original recipe includes hoisin sauce. Since I didn’t have any, I added 1 extra tbsp of soy sauce (for a total of 3), 1 tbsp of oyster sauce, and about 1 1/2 teaspoons of brown sugar, instead of the hoisin sauce. Boil a pot of water. 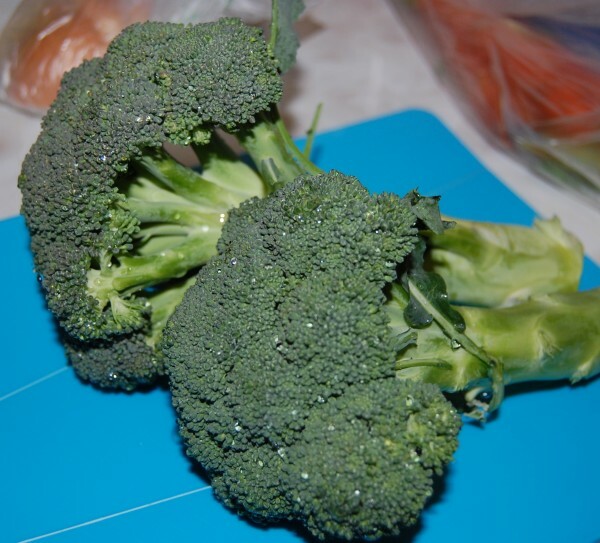 Once boiling, add broccoli florets and cook for about 30 seconds, then drain water and set broccoli aside. Brown ground beef in a large skillet, stirring until it crumbles; drain and keep warm. Pour sesame oil in pan and heat till hot. Saute onion, carrots, garlic, ginger, and red pepper flakes in hot sesame oil until tender (although I like my carrots to still have some crunch, so I added them a little after the rest of these ingredients). In a bowl, combine cornstarch and beef broth, whisking until smooth. Stir broth mixture and soy sauce into onion mixture and also add brown sugar and oyster sauce. Bring to a boil, stirring constantly; boil, stirring constantly, for 1 minute. 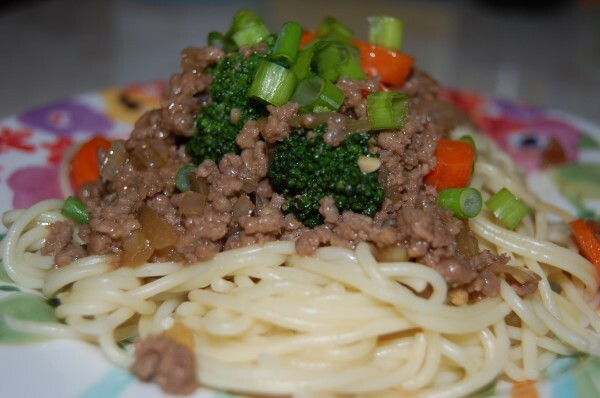 Stir in ground beef and the cooked broccoli florets. Toss with hot cooked pasta, and sprinkle with sliced green onions. I’m a wimp and can’t handle spicy food, so I definitely dialed down the pepper in my version. If you like it spicy though, feel free to add more red pepper flakes. 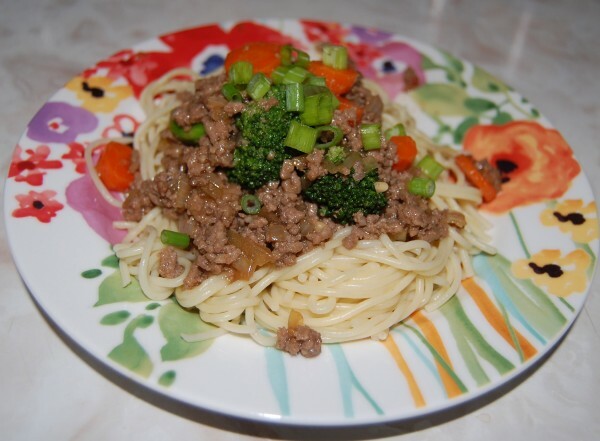 You could also try making this meal vegetarian by removing the ground beef and beef broth and using mushrooms and vegetable broth instead. If you decide to try this recipe, let me know how it goes!